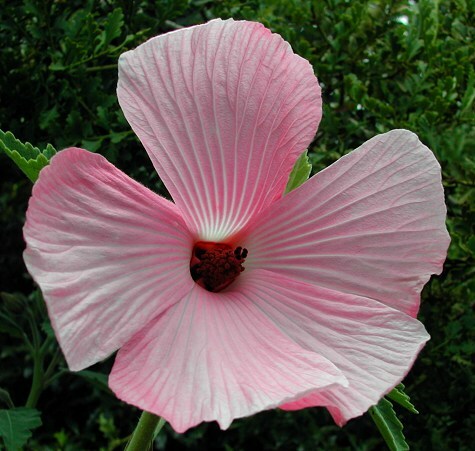 The beautiful Australian Pink Hibiscus - Hibiscus splendens is a fresh break from the gaudy modern hybrids. 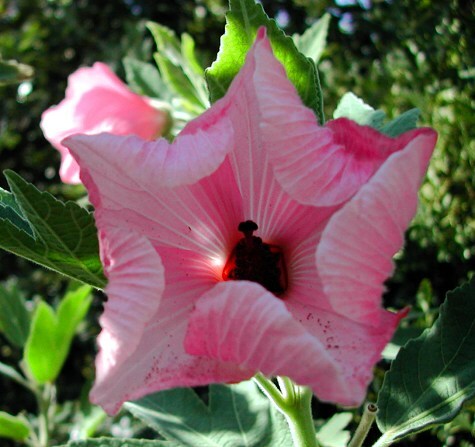 Its big blooms are 6 inches across, with soft-pink petals that are pinstriped with white veins. The plant was called "the king of all the Australian plants" by botanist Charles Fraser, who wrote about it in 1828. It is found only in eastern Australia, where it grows to 15 feet tall. This is an uncommon plant that is rarely seen for sale. 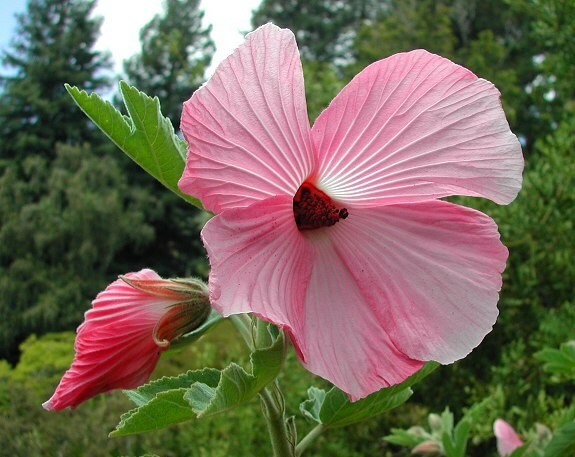 Hibiscus splendens is a fast-growing perennial species that grows about 10 to 14 feet tall here in San Francisco. It takes on an upright, Christmas tree shape if left unpruned. The leaves on this plant are terrific. They are fuzzy like felt, and about 7 inches long. The large blooms appear all throughout spring and summer, and occasionally other times of the year. The petals start out a rich pink color, then soften up as they fully open, while the center stays a deep red. It comes from New South Wales in Australia, where temperatures are moderate year-round and nights are cool. I have no information on how it will do in very warm conditions, so consider it experimental in areas that regularly get above 85 degrees F (29°C), especially if nights are warm (above 65°F / 18°C). 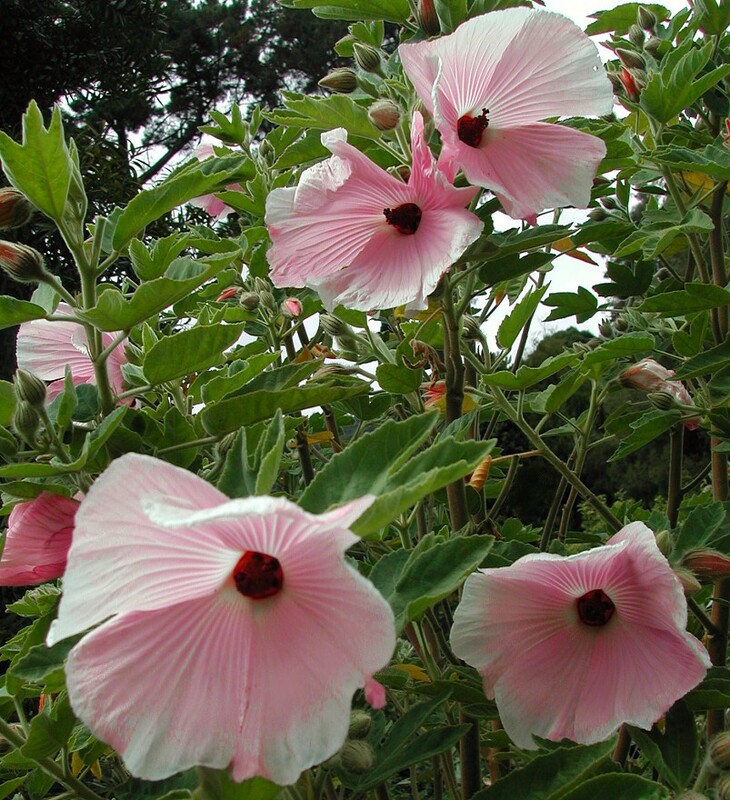 It can handle an occasional, light frost, but it’s best to protect it from all frost. It grows well in a pot, and you may prune it to any height that's convenient. It prefers mostly sunny conditions. Some afternoon shade might be needed in warmer areas. Give it well-draining soil and regular watering. Like with many Australian plants, avoid fertilizers that are very high in phosphorous, like "bloom" fertilizer.